GO MS No 23 Dt 18.11.2014-State Symbols of Telangana State declared | State Symbols of Telangana State | Notification for State Symbols of Telangana State Issued | Forests – Wildlife – Notification of State Animal, Bird, Tree and Flower for the new State of Telangana – Orders – Issued. From the Chief Wildlife Warden & Special Principal Chief Conservator of Forests (Dev. ), Telangana, Hyderabad, Lr. No.3061/2014/WL-2, dt.01.08.2014 and 12.09.2014. In his letter read above, the Chief Wildlife Warden & Special Principal Chief Conservator of Forests (Dev. 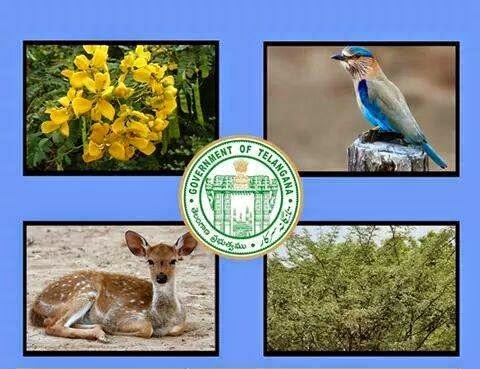 ), Telangana, Hyderabad has furnished the proposals for notification of State Animal, State Bird, State Tree and State Flower of the newly created State of Telangana. 3. The Chief Wildlife Warden & Special Principal Chief Conservator of Forests (Dev. ), Telangana, Hyderabad shall take further necessary action accordingly.